Are falling wages in manufacturing caused by free trade? I’m currently reading a great book called “the Free Trade Myth” by Dr. Ravi Batra. Although I generally consider trade to be a good thing – it increases consumer freedom by allowing access to products from around the world and allows nations to specialize in products/services they are best at making (Canadians just can’t make Swiss watches like the Swiss!) – the author makes some interesting points on the effects that free trade has on manufacturing wages. 1. Elasticity: this is a measure of the demand response to a price change. A product or service is considered inelastic if a price increase or decrease invokes only a small change in demand. A good example of a relatively inelastic product is gas. A price increase in gas certainly aggravates drivers but it generally does not result in a noticeable decrease in consumption since people still need to drive their cars to get to work or to the grocery store. Another example of an inelastic product is agricultural goods. A fall in the price of agricultural goods does not result in a noticeable increase in the consumption of food since there are biological limits to the amount of food people can consume. An elastic product is one where a price change does noticeably affect demand. For example, if a 30% reduction in the price of shirts causes you to buy two shirts, then the price has fallen by 30% and the demand for the product has increased by 100% (2 shirts vs 1 shirt purchased) – this is an elastic response. 2. Productivity: is measured by output per employee. If an employee can increase their output they have increased their productivity. For example, if I utilize a voice-to-text program on my computer to respond to emails and I can respond to 20 emails in an hour versus my initial rate of 10 emails an hour, then my productivity has increased by 100%. Productivity acts as a driver of price, as productivity increases so too does supply and this results in a fall in price. Now, elasticity and productive both affect wages according to Dr. Batra. If productivity increases for a product that is inelastic (such as agricultural products), then the demand will not respond to the increased supply of products and the price of the product will fall. The downward pressure on price will benefit consumers in the form of cheaper agricultural products; however, it will also act to force down wages within the agricultural sector. In fact, this effect has been at play in the North American agricultural industry for several decades now – productivity in this industry has increased dramatically and has been met with falling real wages due to the inelasticity of the goods being produced. Contrarily, if productivity increases for an elastic product, then the dip in the product’s price is met with an increased consumer demand which increases revenue for the manufacturer of the good and should result in increased wages for the production employees. Therefore, productivity gains in industries that create elastic goods should result in increased wages. The manufacturing industry produces goods which are largely elastic and it could be expected that productivity gains in manufacturing would lead to wage gains. However, this is not the case – The US (and Canada’s) manufacturing industry have been experiencing productivity gains and falling real wages for several decades now. According to Dr. Batra this paradoxical event of rising productivity and falling wages in the manufacturing sector is due to free trade. He explains that opening a nation’s doors to products from around the world increases supply so significantly that the downward pressure on the price of goods does result in an increased demand (as we would expect for elastic goods), however, not sufficiently enough to increase manufacturer revenues or the wages of the production employees. Of course, those who favour free trade argue that it allows manufacturing companies to access cheap labour in low-cost nations and pass the associated savings along to their consumers. This enables the consumer to access cheaper goods and makes the consumer wealthier at the end of the day (they can buy more things with less money). Dr. Batra challenges this viewpoint by indicating that those who favour free trade often think the consumer and the worker are two different people when in fact they are the same person. The consumer is no better off if they cannot afford the cheaper goods on account of losing their job due to the forces of free trade. As I mentioned at the beginning of this post, I am not opposed to trade and appreciate that we do live in a globalized word. That being said, “The Myth of Free Trade” by Dr. Batra does provide some food for thought on the effects free trade has on the manufacturing sector within developed nations. What Types of Consumer Goods are Made in Canada? In the last blog post (click here to read) we saw that the manufacturing industry significantly contributes to the Canadian economy – to the tune of $162 Billion in output in 2011. This represents roughly 13% of the Canadian economy’s output [$1,271 Billion in 2011]. But where do manufactured consumer goods fit into all of this? 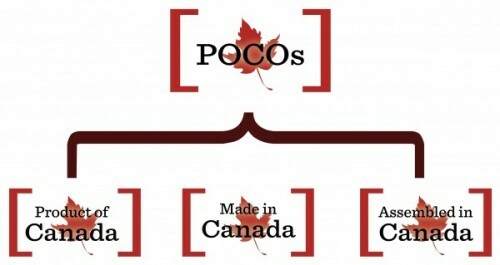 POCOs.ca exists to connect Canadians to consumer goods made in Canada. While it is great that Canadians are employed in the fabrication of airplane parts (ex. Boeing) and city buses (ex. New Flyer), I don’t know too many retail consumers who are in the market for these types of products. So let’s look at what types of consumer goods are made in Canada and how many people are involved in the production of these everyday items. What’s a Consumer Good? – Check out my previous blog post on the topic here. A consumer good is essentially a final products that is ready for personal consumption, this includes: clothes, cars, furniture, appliances, etc. Food and beverages would generally fall into this classification; however, to keep things simple we focus on non-food goods here at POCOs.ca. Clothing Manufacturing: Manufactured clothing including knit clothing, cut and sew apparel, and clothing accessories. Examples: socks, shirts, underwear, pjs, hats, gloves, scarves, etc. Examples: running shoes, work boots, dress shoes, etc. Examples: wallets, luggage, purses, handbags, etc. Examples: loose leaf paper, exercise books, note pads, diapers, toilet paper, etc. Examples: artwork (prints), screen printed clothing, trading cards (think hockey), etc. Chemical Manufacturing: Chemically-based products manufactured for personal and household use. Examples: bleach, hand soap, laundry soap, toothpaste, deodorant, etc. Examples: axes, clippers, cutlery, saw blades, etc. Examples: can openers, frying pans, dishwashers, fridges, stoves, water heaters, etc. Transportation Equipment: Personal transportation equipment. Examples: cars, vans, light trucks, boats, canoes, kayaks, etc. Examples: couches, upholstered furniture, wood furniture, mattresses etc. Other: Consumer goods not covered by one of the above categories. Examples: jewellery, silverware, toys and games, sports equipment, office supplies, etc. Total: All consumer goods manufactured within Canada. 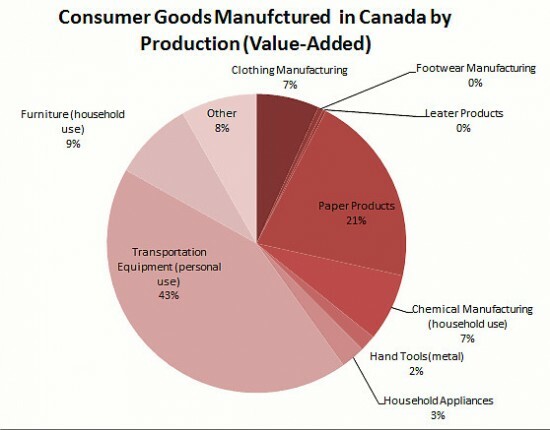 Consumers Goods Manufacturing within Canada by Production (2010). Transportation manufacturing makes up a big piece of this pie, accounting for 43% of GDP added within the consumer goods industry. Paper Products is the second largest contributor to GDP within the consumer goods industry, account for 21% of production. Furniture, Clothing, and Chemical manufacturing are notable players too with their production contributions floating around 10% of the consumer goods industry. 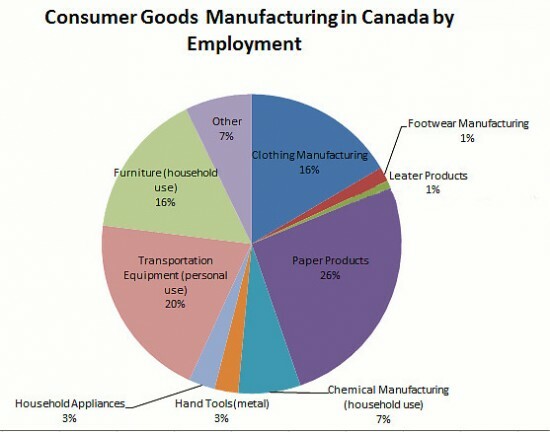 Consumer Goods Manufacturing within Canada by Employment (2010). Although transportation manufacturing contributes the most to GDP, it is not the largest employer. The paper production industry employs more and represents 26% of employment in the consumer goods sector. Transportation manufacturing, furniture production, and clothing are the next three largest employers with each industry floating around 20% of the consumer goods sector. Chemical manufacturing (household chemicals) is the fifth largest from an employment perspective, accounting for 7% of employment. From the numbers I scrapped together from the Industry Canada site, the consumer goods sector generates $19.2 Billion in value-added output (GDP contribution), this represents roughly 12% of the $162.1 Billion in GDP contributed by the Canadian manufacturing industry. From an employment stand-point, the consumer goods sector also represents approximately 12% of the total manufacturing industry. I should mention that the figures shown above are likely on the conservative side. There were a few instances when manufactured consumer goods fell into the same NAICS categories as intermediate or capital goods. For example, manufactured kitty litter (a consumer good) was classified in the same category as embalming fluids (an intermediate good used by funeral homes). Also, bicycles (a consumer good) fell into the same category wit armoured military vehicles (a capital good used by the military). In cases where consumer goods and intermediate or capital goods were mixed, I did not include those figures in my numbers above – resulting in an understatement on the breadth of consumer goods manufacturing in Canada. Elsewhere on the Industry Canada site, they state that the consumer goods sector (in this instances they included the food and beverage industries) represents one third (33%) of the GDP generated by the manufacturing industries and 40% of employment within the manufacturing industry. As POCOs.ca does not focus on the food and beverage manufacturing, the consumer goods sector as discussed on this site is smaller than the Industry Canada figures; however, the true numbers on employment and production within the consumer goods sector likely lie somewhere in between today’s conservative estimates and the more liberal figures provided by Industry Canada. All in all, to sum everything up – the consumer goods manufacturing sector within Canada is no small potatoes! Grab a coffee, this is a snoozer. I’m sure to arouse the ire of some other armchair economists out there as I fumble and finesse this definition to fit the purposes of POCOs.ca, but here we go…. A Consumer Good is a good that is complete for final consumption/use. Consumer goods are separate from intermediate goods and raw materials. Intermediate goods are goods produced for further modification or incorporation into final goods (consumer goods), and raw materials are unmodified commodities. For example, a car is a consumer good, while the chassis is considered an intermediate good, and the steel used to create the chassis is a raw material. Quick question: Is an airplane a consumer good? A: No, or at least not likely (unless your last name is Trump or Branson). An airplane is considered a capital good – a final good used in the production of another good or service. An airplane is considered a capital good since they are generally purchased by airlines which use them to vend flights (a service) to their customers. Another example is a lathe purchased by a furniture manufacturer. The furniture produced by the manufacturer is a consumer good – provided it is used for individual, personal use – and the lathe is a capital good. Consumer Goods @ POCOs.ca =Consumer Goods - Services - Foods/Beverages. What role does the Manufacturing Industry have within the Canadian Economy? The Canadian economy can be divided into 2 classes – the goods-producing industries and the service-producing industries. The goods-producing industries are generally associated with the production of tangible goods, and include: Agriculture, Mining/Oil/Gas, Construction, Manufacturing, and Utilities. The service-producing industries (15 in total) provide primarily services and include: Wholesale/Retail Trade, Real Estate, Transportation, Financial Services, Education, Health Care, etc. The complete list of the 20 industries that make up Canada’s economy can be seen here. In 2011, Canada’s Gross Domestic Product (GDP) was $1,271 Billion [reported in 2002 dollars], the goods-producing industries accounted for $365 Billion (28.7% of total) and the service-producing industries accounted for $906 Billion (71.3% of total). Of the goods-producing industries, manufacturing is the largest within Canada and accounts for $162.1 Billion of GDP – 44.4% of the goods-producing industries’ output and 12.8% of the total GDP of Canada. Despite today’s prevailing attitude that ‘Manufacturing just doesn’t matter’ – it does and it contributes significantly to Canada’s economy. 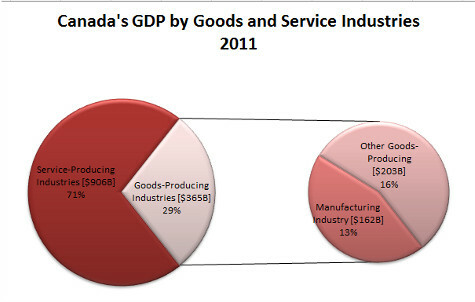 Manufacturing represents 44.4% of the goods-producing industries output and 12.8% of Canada’s total GDP. POCOs.ca connects Canadians with Canadian-made consumer goods. Consumer goods manufacturing is a sub-sector of the Manufacturing industries and we will discuss what this sub-sector of manufacturing looks like in Canada in a future post. Great question! And you’ve come to the right place to get an answer. A POCO is a Product Of Canadian Origin – a term we use to describe products that bear one of the following three labels: “Product of Canada”, “Made in Canada”, or “Assembled in Canada”. A POCO product is a consumer product that has all or some of its manufacturing process occurring within Canada! POCO: Product of Canadian Origin. A POCO includes products “Made in Canada”, “Assembled in Canada”, and “Products of Canada”. Product of Canada: A product that has had it’s last substantial transformation happen within Canada, and the vast majority (>98%) of the manufacturing cost has been incurred in Canada. Products bearing this label are very Canadian. Made in Canada: A product that has had it’s final substantial transformation happen within Canada, and the majority (>51%) of the manufacturing cost has been incurred within Canada. This label is generally used with a qualifying statement indicating that imported materials were used in the production of the product (ex. “Made in Canada of domestic and imported goods”). Products bearing this label are Canadian with a some international zest! Assembled in Canada: Some of the manufacturing cost associated with producing the product have been incurred within Canada, but it is less than 51% and therefore can not bear the “Made in Canada” label. These products are more international than domestic. The Competition Bureau provides a more in-depth (and long-winded) explanation of the above labeling categories here. POCOs.ca promotes POCOs – Products Of Canadian Origin and discusses the importance of buying locally on a national level – buying canadian!